Taiwanese consumer electronics giant Acer is having a global press conference in New York right now, and they just wrapped up the hardware portion of the event. In its wake are three new Android devices to lust over. 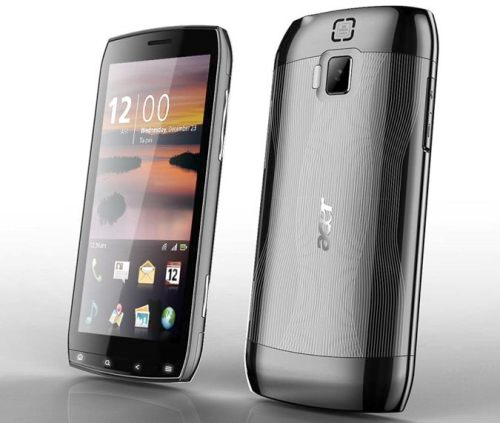 Rather than forcing you to go with one size only, Acer has an attractive trio to choose from. First up was a 10-incher, powered by a 1GHz Tegra II. 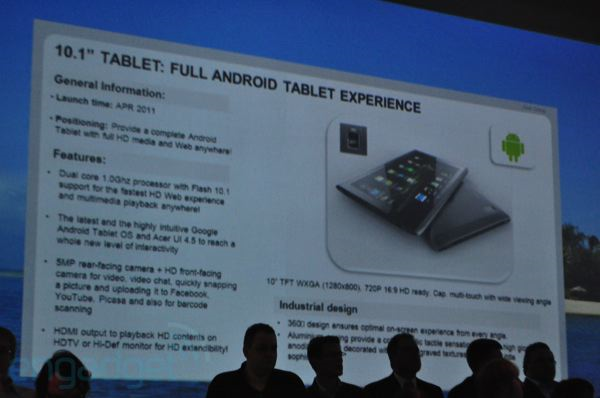 The device will run Google's "Android Tablet OS" (Honeycomb?) 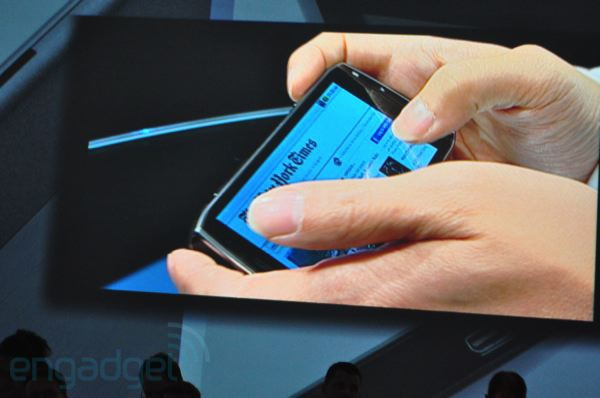 with a custom Acer UI, but was demoed running Froyo. In a nice change from the norm, it has a WXGA (1280x800) screen, as well as a 4 MP camera on the back, and HDMI output for 720P playback. 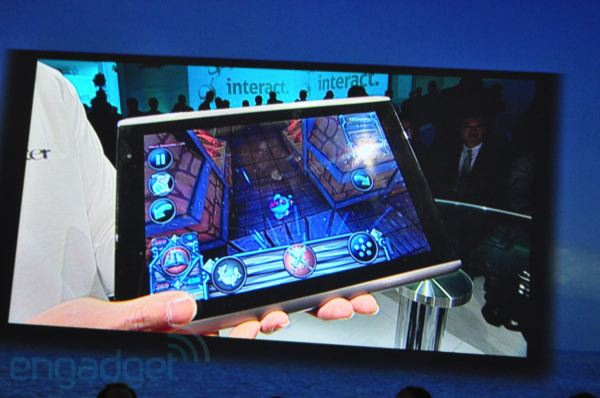 The device will be released in April 2011. Moving on from the big 'un is a mid-scale 7-incher. Eschewing the popular WSVGA (1024x600) of the Galaxy Tab and others, the 7" device one-ups the competition with another densely-packed WXGA display. This device will have one of the 1.2GHz Qualcomm dual-core CPUs, which we first heard about back in September. The April '11 launch date lines up nicely with Qualcomm's previous promise of 1.2GHz DC availability in "early 2011", so this looks like one to watch out for next year. 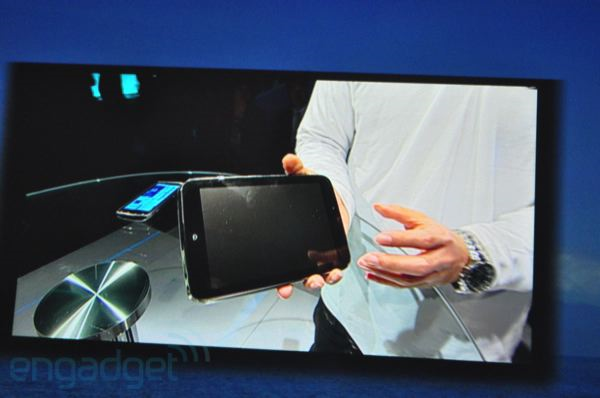 Finally, Acer revealed a "100% tablet, 100% phone" device to go along with their 200% tablet tablets. Their rather large 4.8"-screened phone doesn't have the WXGA screen of its larger siblings, but is still ahead of the curve with a super-wide 1024 x 480 resolution. Exactly how a device of those proportions will lie in the hand is still a mystery, but it's a pleasant surprise to see something that isn't WVGA for once. Sadly, this phone is said to only have a 1GHz Snapdragon, so no dual-core fun for now. However, it does have a "six-axis" accelerometer, Bluetooth 3.0, an 8 MP rear camera, and a 2 MP front cam.